The general style is high-waisted with a standing collar though there were other varieties and civilian coats were also worn in the ranks at times. It could have one or two-piece sleeves, and in the second case, the back seam could be left open for a few inches to provide a turn-back. Top of the sleeve wings are not a necessity either, they were the fashion for doublets, though not always seen on soldier’s coats. 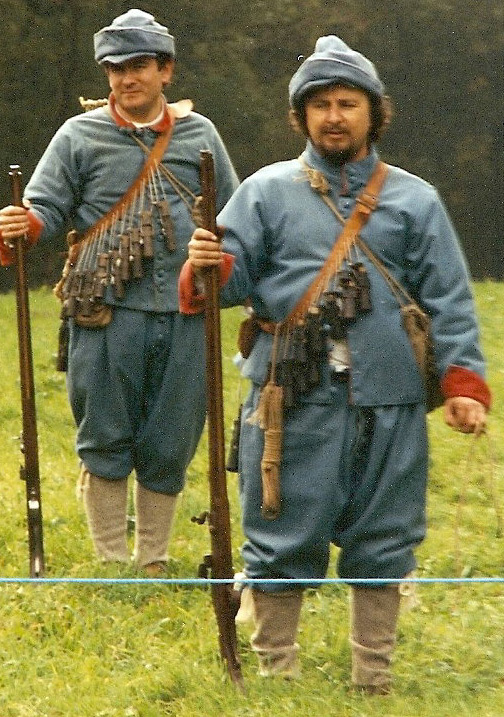 They may however have provided additional shoulder protection for carrying muskets or pikes on the march. Coats were closed with buttons, closely spaced down the front to run from collar to waist. Twelve buttons is a minimum and the coat would be buttoned to the neck. You can go for cloth or metal, flat or spherical are all ok, though thread wrapped ones may just be a tad too high quality. Picture on the left and above of a coat by The 1642 Tailor. There are also several schools of thought as to exactly how the coats were cut. One conjecture is that they were sometimes made by unskilled tailors and a pattern was developed to cater for a low level of skill and equipment that involved a squared off pattern that could be torn from the cloth rather than cut. I guess all kinds of patterns were used, the slightly tailored one being my favorite as it is seen in several images from the time, but the square cut, quick fix pattern has the advantage that it uses less cloth, although it’s a moot point about the unskilled tailors. Most if not all the images seem to show a more tailored coat with flared skirts. This link will take you to a variety of pictures from the period. It is possible however to cut a more stylish coat without wasting too much cloth. 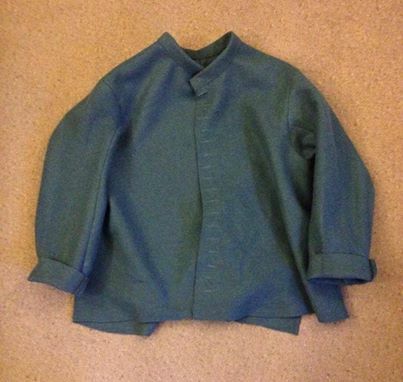 This image shows a mock up coat made from one and a quarter yards of broadcloth, an amount found in several records of army issues. It’s short, reaching to just below the thighs and I found that there wasn’t even enough left to make a few cloth buttons with the waste. This coat, referred to in the records as a jump coat is also unlined and should be fastened with 18 or 20 buttons. Having tried several methods of making coats, and looking at an original in the Colchester Castle Museum, I now believe that the best and quickest method, which would involves using fabric for the shell that is fulled enough so that it holds a cut edge. On this coat (left), the lining was turned in but the wool edge left raw as it was cut. 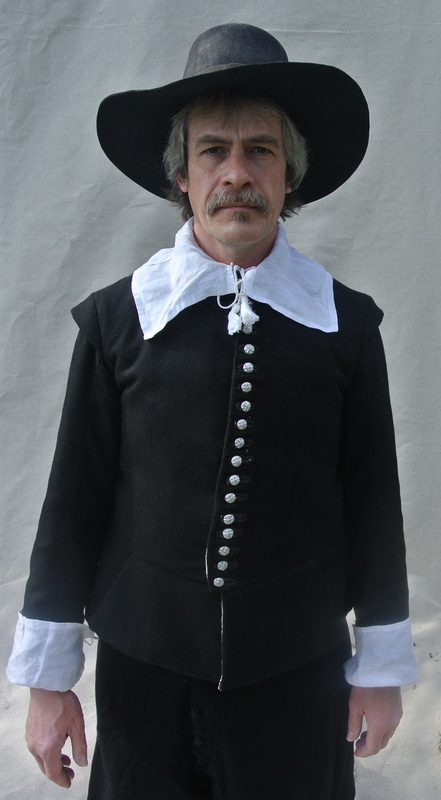 This is common in coats from the late 17th century and was probably used in the 1640s, and though no extant examples have been identified, it is a good assumption that it could have been used for Civil War coats. 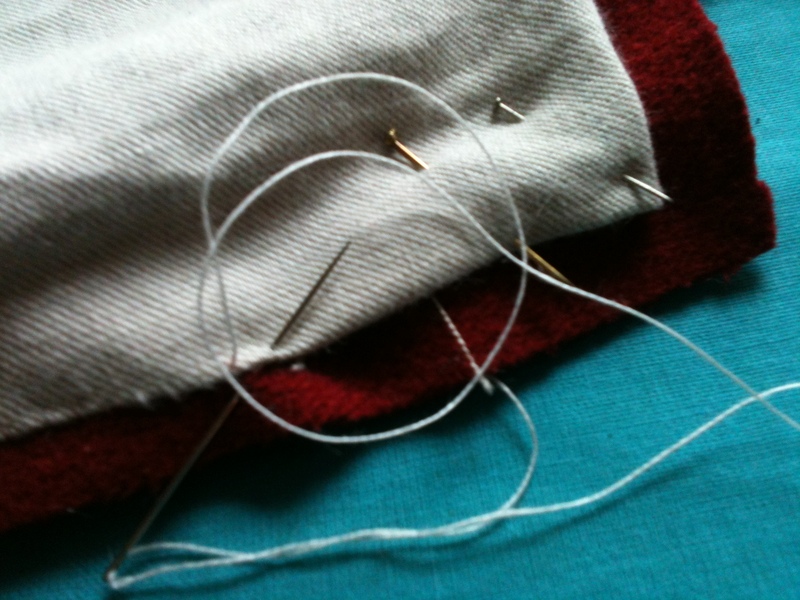 Using this type of fabric it is entirely possible to construct the garment by layering the fabrics and oversewing the two together with only a running stitch. The sleeve tops and collar edges would need turning in and the top of the open seams between the tabs would have to be strengthened with extra stitching but the rest could be left raw, even the lower collar edges, leaving little that needed to be turned in and no extra seam allowances. This method also works with montero skirts and peaks. The photo shows a detail of the collar edge and opening of the coat worn at the top. Issue coats were also much more likely to have been made in batches rather than job lots. A tailor contracted to make a thousand coats for an army would have to subcontract and thus even a bulk order such as for the Oxford army or the army that went to Ireland would be made up of a wide spectrum of cuts and colours as separate bolts of cloth would be used by different tailors who probably also had their own favorite pattern. If you were part of a militia or a trayned band you may have had an issue coat or you may just have worn your own clothes. 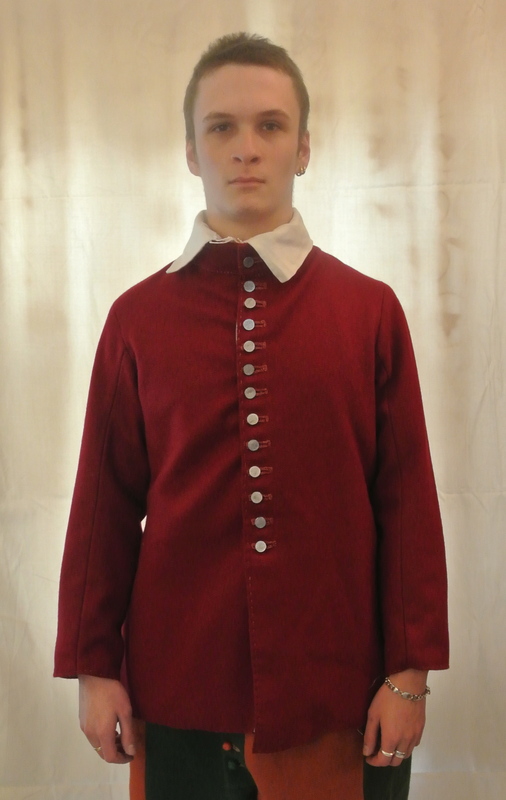 In this case your top layer would either be a plain Soldier’s coat or perhaps a more tailored doublet, see right. 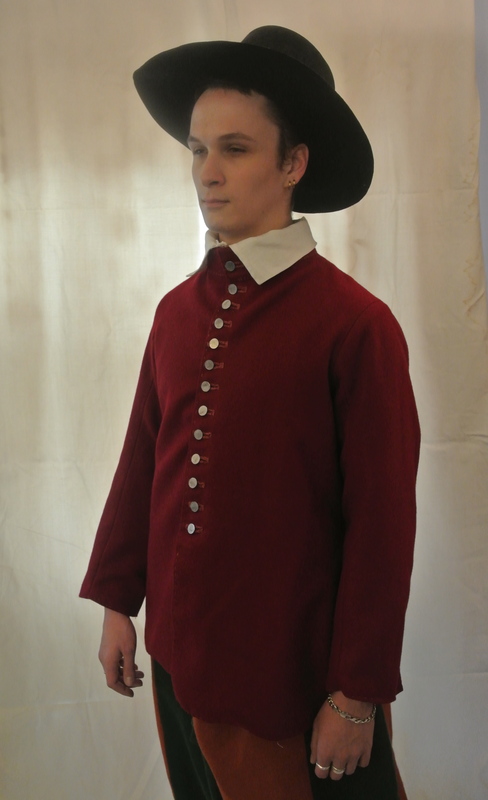 Selecting what colour coat to wear in reenactment is much like choosing the length of a piece of string. There are references to coats being issued to soldiers. 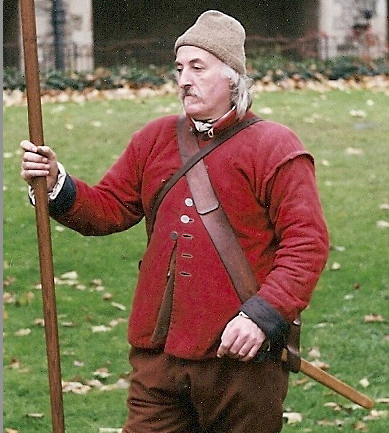 For instance Oxford regiments were given coats, breeches and montero caps in 1643, so if you were an Oxford royalist in July of that year you would wear a nice new red or blue coat, though not necessarily a well fitting one as uniform issue clothes have never been made to fit. The red coats would fade rapidly on campaign, the blue ones less so but maybe after only a month or so in the field they would probably be considerably the worse for wear, so the same Oxford royalist half way through the year would wear a coat of a shabby quality that may take several years of reenacting to achieve as this chap from Fairfax’s regiment shows. Picture on the right by Chris Thomas. For example Hampden’s regiment in the parliament army started in 1642 with issued green coats with yellow linings. By spring of the following year the coats were faded and patched, and as the yellow in the green dye would fade faster than the blue, they would have looked more like a blue-coated regiment. Up until the autumn when a new issue of grey or red coats was made, their clothes would possibly have been supplemented by some civilian doublets. By 1644, having gone through several more changes they would have been in red coats and breeches! Quite a range to choose from should you want to represent this regiment, but not uncommon in long lived units throughout the war. Thus the big problem is that civil war soldiers were not uniformed or regimented in their dress in a way that modern troops are, and as I have described, the coats varied widely even from season to season, so for a particular company or group in reenactment you have to decide the period you are presenting and how to portray the effect that campaigning would have had on the clothes whilst presenting some kind of unified whole. The picture here shows one solution. The soldiers were issued with authentically dyed uniforms that have faded over time. The blue ones become almost grey in hue, whilst red becomes pale also. The fading is uneven in places, shoulders and sleeve tops for instance losing colour more quickly than the underarms. There are batches of uniforms evident here. 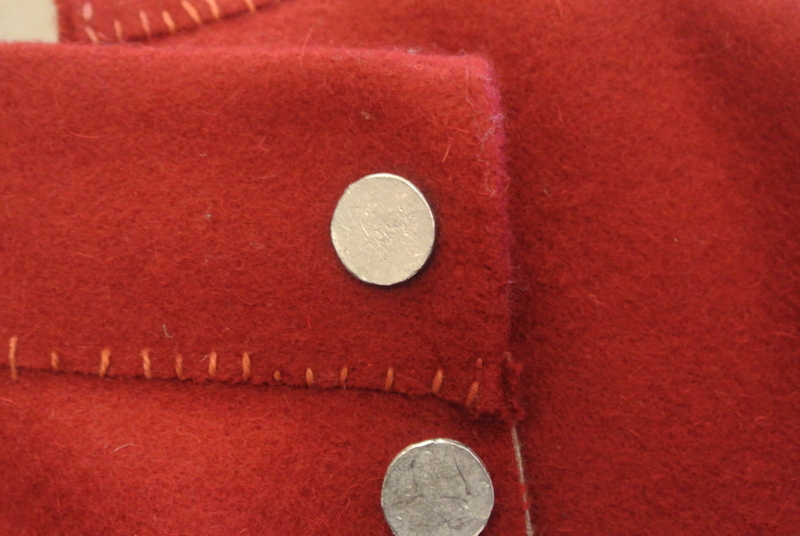 Some coats being newer are less faded, producing a parti-coloured effect that may replicate the Oxford army in issued coats, having been in the field for a few months. This photo by Chris Thomas are of Lord Hopton’s, a regiment of the King’s Army.